Protestors gathered September 1 at New Mexico State University in Las Cruces. Among the defenders of Pluto as a planet was Al Tombaugh, foreground, with his wife Cherylee Tombaugh to his right. Al Tombaugh is the son of the late Clyde Tombaugh, who discovered Pluto. Defenders of Pluto as a planet rallied at New Mexico State University last week, joined by the wife and son of Pluto's discoverer, Clyde Tombaugh. The Sept. 1 gathering in Las Cruces was spurred by last month's decision by the International Astronomical Union (IAU) to reclassify Pluto as a "dwarf planet" and, by the new definition, not really a planet at all. The message from the protestors: Don't rewrite the textbooks yet as the debate's not over. 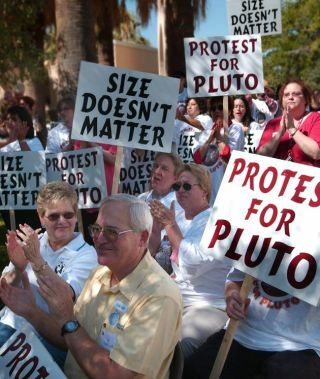 New Mexico State University (NMSU) astronomer Bernie McNamara, speaking to a high-spirited group of Pluto supporters outside the university's Zuhl Library. McNamara pointed out that the IAU had been considering a different set of criteria for defining what a planet is- criteria that would have expanded the number of planets from nine to 12- shortly before the Aug. 24 vote was taken. The definition was reworked at the last minute and only a little more than 400 IAU members voted. There are about 10,000 professional astronomers around the globe. "This was not a statement by the astronomical community at large," McNamara said, adding that a petition opposing the IAU definition of a planet is now circulating among the world's planetary scientists and astronomers. McNamara joined about 50 NMSU students and staff members in their criticism of the IAU vote. There is a strong tie between the university, Pluto, and discoverer of the object, Clyde Tombaugh ... something like a family affair. Tombaugh was 24 years old when he discovered Pluto from the Lowell Observatory in 1930. Tombaugh came to New Mexico State University in 1955 and developed a world-class astronomy research program. He officially retired as a professor emeritus in 1973 but he continued to be active as a lecturer for many years after that. Tombaugh died in 1997 at the age of 90. Patsy Tombaugh, the famed astronomer's widow, and their son Al Tombaugh also participated in the NMSU protest. "I'm disappointed that this has happened," Patsy Tombaugh, 93, told The Albuquerque Tribune.